Is it time to give your puppy their very first bath? Bathing puppies can be a little trickier than bathing adult dogs. You have to take a far gentler approach to avoid frightening your puppy and giving them a lifelong aversion to the bathing process. You also need to use a milder dog shampoo for puppies– one that contains organic ingredients and does not irritate your puppy’s delicate skin. The puppy shampoo ingredients are natural and include buttermilk and linseed oil. The shampoo does not lather much, but it will leave your pet with a clean, soft, and shiny coat. The scent is subtle– almost non-existent– and the shampoo formula is tearless. This means that even if the shampoo gets into your puppy’s eyes, it will not sting and cause irritation. When Should You Bathe Your Puppy? What Kind Of Dog Shampoo For Puppies Should You Get? Can You Use An Adult Dog Shampoo For Bathing Puppies? Your dog is going to need to be bathed on a great number of occasions in the course of their life. Getting them accustomed to bathing while they are still young and comparatively more manageable is a sound idea. They can’t be too young though. It is advisable to not bathe puppies under six weeks; their mother takes care of all their cleaning requirements at this stage, and there is a risk that the bathing products could harm their skin. Puppies of six weeks and older can be washed at their owner’s discretion, but the general recommendation is to restrict bathing to two to four times a year. You may bathe them more often only if your pets get too dirty and stinky, or if they have skin conditions that require special, medicated baths. Otherwise, less is better. Washing your dog with dog shampoo can strip them of the natural oils in their skin and fur, and, if you do it too often, your puppy could end up with dry skin issues. bath time less stressful for both of you. seek and drag before every bath. the puppy to take alarm and start wriggling. Scrub your puppy with gentle care and then rinse off the puppy shampoo with clean water. towel. Move them away from the bathing area and dry their paws. If you have a well-secured sunny spot, where your puppy can catch the sun without catching any dirt, place them there for further drying. may not be good for your puppy’s skin and hair. additives that could harm your puppy. Make sure the puppy shampoo is ‘Tear Free’. This is very important. irritation and inflammation is a necessity. advice on the right shampoo to use. A puppy’s skin is softer, more delicate, and more sensitive than that of an older dog. So, a shampoo formulated for adult dogs may not be suitable for bathing puppies. Check the shampoo label and only use it if the manufacturer states that the dog shampoo can also be used on puppies. With a nice, clean cherry fragrance and a good lather that rinses off well, this puppy shampoo will leave your puppy’s coat softer and shinier; the fragrance is not long-lasting, but your pet may prefer that. The shampoo contains natural ingredients that include cherry essence, aloe vera, coconut extracts, and olive oil. It is formulated to not irritate your puppy’s eyes and skin. This puppy shampoo does not contain sulfates and parabens, and is gentle on your puppy’s skin. The fresh orchid fragrance can last for several days. If your puppy is uncomfortable with the scent, you can dilute the shampoo before applying it. Containing aloe vera and cornflower, this puppy shampoo is formulated for sensitive skin. 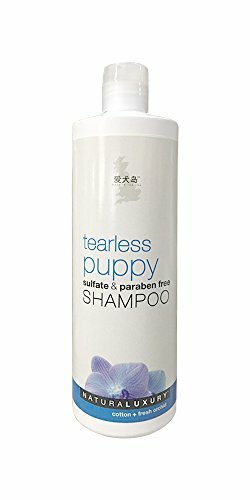 If your puppy has any itching issues, this is the shampoo you want. It will soften your puppy’s coat and give it a good shine, and is safe for your puppy’s eyes. Formulated by veterinarians and packaged in a biodegradable container, this shampoo contains milk and honey and has a very gentle and thorough cleansing effect on your puppy’s sensitive skin. Diluting the shampoo with water before use will make it last longer and still produce a good lather. A gentle, tearless shampoo, containing coconut and palm oils, this is a great grooming product for puppies with sensitive skin. It rinses off well and does not strip off the natural oils on your puppy’s coat. You can dilute it before use. The scent is light and floral. As this shampoo does not contain parabens, sulfates, petroleum products, artificial dyes, and artificial scents, it is safe to use on your puppy. For effective cleansing, lather your puppy and let the shampoo remain for about ten minutes before rinsing off. You may want to try this shampoo if your puppy suffers from skin conditions and allergies. The puppy shampoo contains oatmeal, aloe vera, rosemary, and chamomile, and is free of parabens, drying alcohols, and artificial dyes. It is gentle on your puppy’s sensitive skin. Puppies with allergies will benefit from the moisturizing effect of the natural glycerin in this puppy shampoo, and also from the absence of sulfates, parabens and artificial scent. The tearless formula will protect your puppy’s eyes. The lather is minimum and rinses off well. 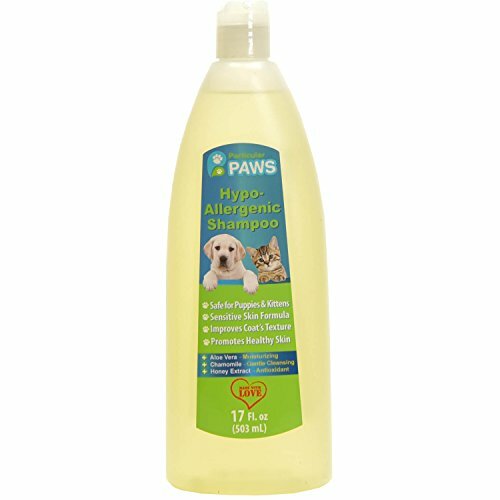 With non-toxic, natural ingredients like aloe vera, chamomile, rosemary, and honey, this is a safe and soothing shampoo for hypoallergenic puppies and will relieve a host of skin conditions. It creates a good lather and rinses off fast, leaving your puppy’s coat clean, soft, and shiny. In addition to these store-bought shampoos, you can also prepare a puppy shampoo at home from natural ingredients like lemon, aloe vera, baking soda, vinegar, neem oil, and coconut oil. Mix these ingredients in warm water and let cool. Use the concoction to bathe your puppy and then wash off with clean water. There are many different ingredients that you can use to make natural dog shampoos; you can find many recipes online and experiment with these to see which work well with your puppy. Aside from being cheaper, natural dog shampoos have no side effects. No matter which puppy shampoo you use, remember to be gentle and patient with your puppy. While keeping them clean is certainly necessary, it is as important to do this without causing your pet any undue alarm or stress. You don’t want your puppy to take a lifelong aversion to bathing. So, start slow and take as long as it takes to get them to feel comfortable with being washed.